Year-long residents participate in two angos and twelve sesshin. For those wishing to devote an extended period of time to their spiritual practice, the Year-Long Intensive is a demanding but life-transforming experience. Committing to a year allows you to benefit from the seasonal rhythms of the schedule, build a deeper connection to the sangha, develop a relationship to the teachers and seniors, and feel how your practice matures over time. The daily schedule for year-long residents is the same as for the month-long residents, but extended residency requires that you approach your practice and your work with a longer view, harmonizing with the seasonal shifts and giving yourself completely to the unfolding experience. Each season emphasizes different aspects of training. The spring and fall quarters are angos, 90-day intensive periods of concentrated practice. During the summer, training emphasizes the arts and body practice, while in the winter the focus is on healthy solitude and the development of self-reliance. 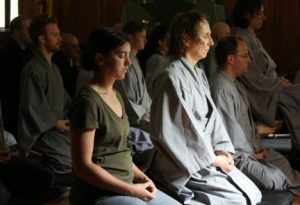 Year-long residents participate in two angos and twelve sesshin, as well as shorter intensives and retreats on different themes. You’ll participate in art practice, body practice, liturgy, and work practice. You’ll study the Precepts, the sutras and some Buddhist history. Add the constant mirror of the resident sangha and the result is a unique and powerful opportunity to get to know yourself, develop your Zen practice and transform your life. The Monastery relies heavily on year-long residents to staff the various work positions, so you will be asked to take on some very real responsibilities essential to running the Monastery and its programs, including working independently and supervising others. Because of this, year-long residents are asked to enter with a strong, clear sense of commitment. This means also appreciating the ways in which the Monastery sangha is committing to you, too. As a year-long resident, you’ll have an amazing opportunity to practice meeting your limits and seeing how they dissolve when you stop investing in them. You can see where genuine peace of mind arises from, and how life can become much bigger than how you feel at any particular moment. Contact the Monastery at (845) 688-2228 or registrar@mro.org to ask questions about residency or to request a residency brochure and application. Each year-long period of residency must begin with a One-Month Residency. Please indicate your interest in a potential year-long residency on the application. You’ll be asked to examine your motivation for engaging spiritual practice and to express that motivation in writing and in a phone interview. The cost is $850 per month, which includes all meals, lodging, training and most retreat fees. A $100 deposit is required upon acceptance. 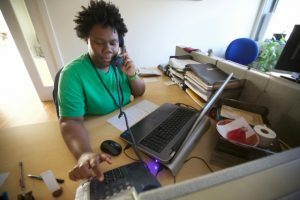 Year-long residents usually apply for some form of work scholarship, in which training fees are significantly reduced or even eliminated according to need, skills and motivation.